As a leading provider of some of the best groomed trails in the Northeast Kingdom we take pride in offering the best groomed trails. We are dedicated to serving the needs of our sport each and every day. The Country Riders maintain 126 miles of class 1 trails in the Northeast Kingdom. Country Riders Snowmobile club was formed December 3, 1975 with a total of 12 members. Country riders was formed when Interstate 91 was built. This separated the trails that were presently being groomed by one club. There was one Alpine groomer to groom all the trails. This was not possible, time wise, thus splitting the territory and becoming Country Riders. Country Riders 1st groomer was a 1970 Lely which was used to groom twice a week on the clubs two lane trails, about 30 miles of it. In 1979 the club purchased their second groomer, a 1969 Tucker Snow Cat. The drag was built by club members. In 1986 the club purchased a Ski-dozer 300, again the drag was built by club members. At this time the club had about 70 miles of trails from Lake Memphremagog to Newport Center, Coventry, Troy, Westfield, and Jay. Our next groomer was a 1986 Tucker Snow Cat. The drag was built by members who mimicked a drag from Rock Island, QC. It was 10 feet wide and was used for more than 10 years. Our fifth groomer was a 1996 Tucker Snow Cat and was purchased in 1999. This was a huge step for the Country Riders. This unit had less than 1000 hours on it, at a price far more than what we were used to paying. At this time it became essential to have reliable up to date groomer free from breakdowns. We were grooming 110 miles of two-way corridor trails. We were maxed out for time trying to groom every trail just twice a week. The sport of snowmobiling over the years became increasingly more popular. Our club started with approximately 60 members in 1975 with today almost 400 members. In 2001 we added another 15 miles of trail and another groomer unit to the fleet. We split up the 125 miles into two grooming runs. This got us by for the next couple of years. It was decided in 2004 that we should purchase a third grooing unit. This was done to shorten the amount of time that the operators were out each night. 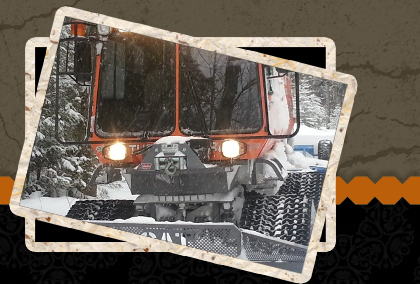 As of today we have 126 miles of trail and three Tuckers Sno Cat grooming units. A 2011 crew cab, 2005 metal lagged unit for the mountain, and a 2004 rubber track unit for the valley.